On a Friday in May, a stroke felled George Crocker and made him unable to even roll over on the floor of his garage. 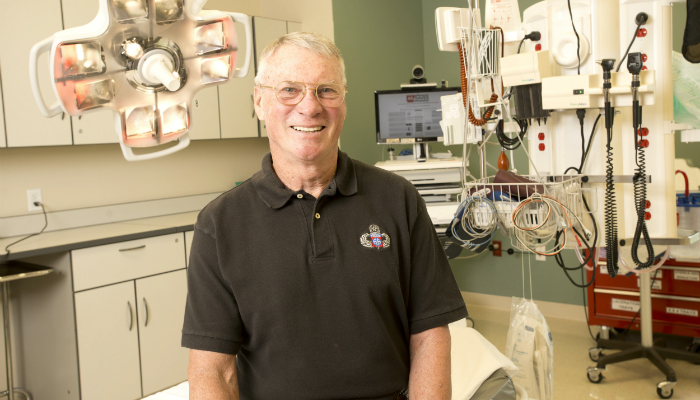 By Sunday, he was dancing on the floor of his patient room in the UAMS Medical Center, thanks to quick treatment through the AR SAVES network. A retired Army lieutenant general with 34 years of service, Crocker on May 8 was doing some routine maintenance on one of his cars at his home in the Choctaw community outside Clinton. While doing that, he felt a sharp pain in the back of his head. Crocker has no memory of falling, but the next thing he recalls was being face down on the floor of the garage and unable to move his arm or roll over onto his back. His wife, Vonda Crocker, found him a few minutes later when she entered the garage. She called emergency medical services, and they in turn alerted the Emergency Department at the Ozark Health Medical Center in Clinton, an AR SAVES partner. Because of the early notice, the department’s staff was able to initiate a telemedicine consultation with an AR SAVES physician at UAMS within about 30 minutes after Crocker had his stroke. The physician recommended Crocker receive t-PA. Within just a few minutes, his arm, which had locked into a cramped position against his torso at the onset of the stroke, began to relax, Crocker said. Next, he was transported by ambulance to UAMS Medical Center, underwent a brain scan, administered more t-PA via a catheter by interventional radiologist Adewumi Amole, M.D., and had two clots removed from his brain. Nicolas Bianchi, M.D., is medical director of the AR SAVES Telestroke Program. On May 9, Crocker was transferred to a general patient ward in the medical center, and by Sunday, he had fully recovered. By May 14, just six days after his stroke, Crocker helped out the AR SAVES program that helped him. He did it by throwing a ceremonial pitch at Dickey-Stephens Park in North Little Rock as part of a Strike Out Stroke Night event organized by AR SAVES in cooperation with the Arkansas Travelers baseball team for stroke awareness.